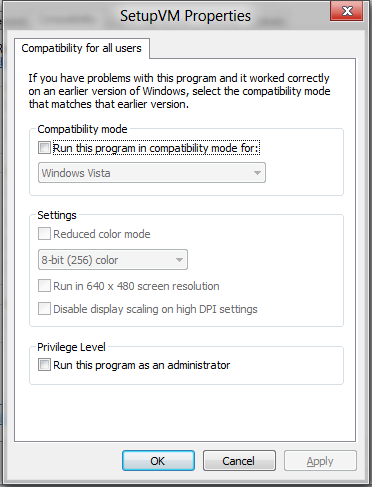 In my quest for testing software on the Windows Developer Preview x64 release (a.k.a Windows 8) I had to test Microsoft’s System Centre Virtual Machine Manager 2012 Beta console. 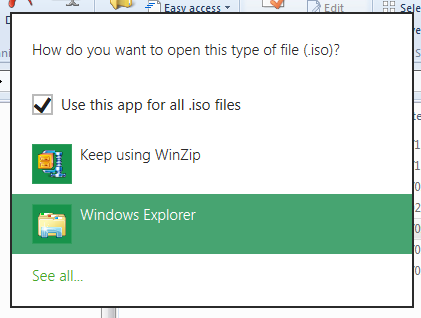 So I had the product downloaded from MSDN and was ready to use the Windows 8 “Mount ISO” feature. However it had disappeared from Explorer. 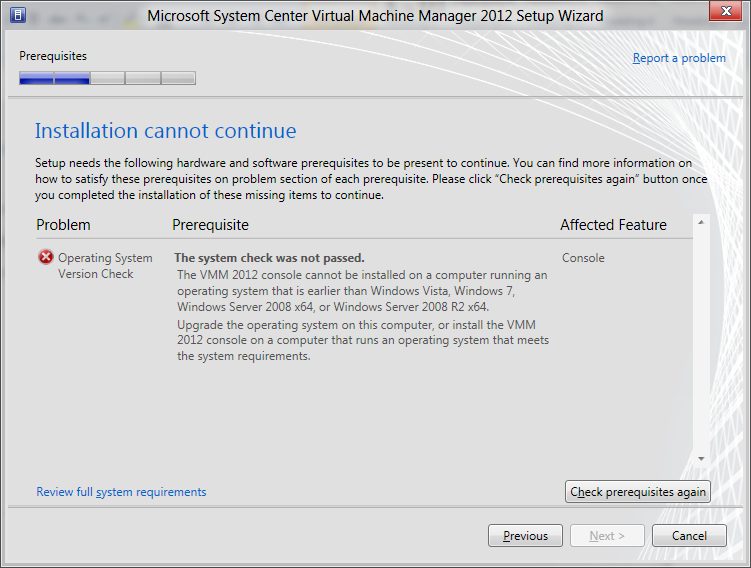 This however threw an error “Virtual Machine Manager server is not supported on this operating system. 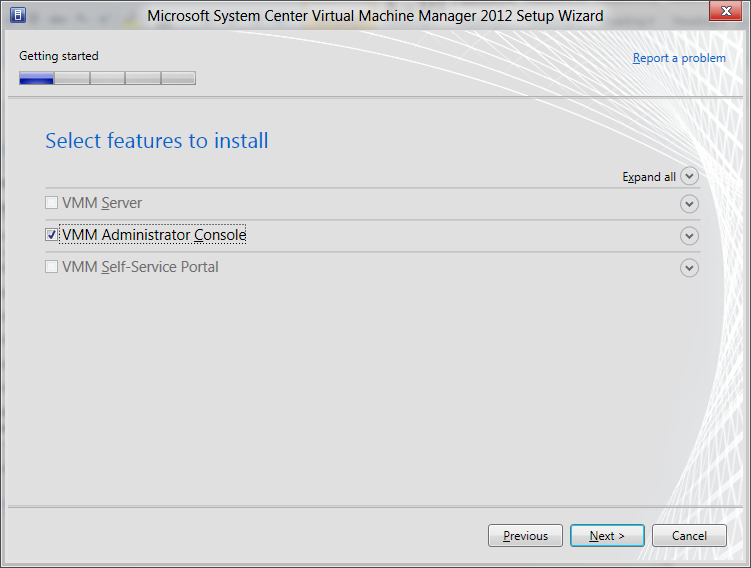 For more information, see ‘Supported Operating Systems for VMM’ in Virtual Machine Manager Setup Help. 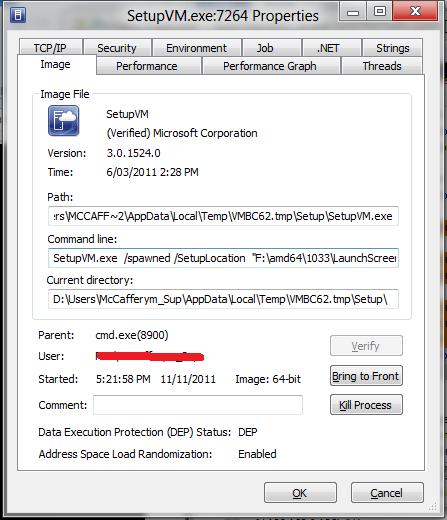 Using Process Explorer (http://live.sysinternals.com/ProcExp.exe) I found that it was actually extracting into the temp folder and running from there. <Description>The system check was not passed. 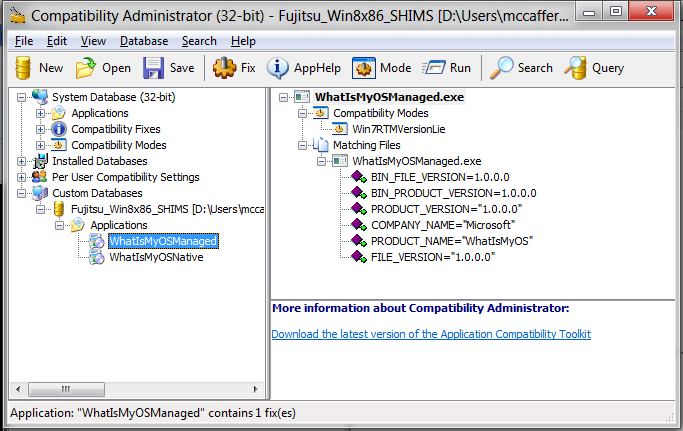 I also tried applying a Windows 7 Version Lie SHIM via Microsoft Application Compatibility Toolkit 6.0, still failing. In ProcMon I did a filter on Details contains “6.2” but found no results. (i.e. a reg query) Another way I thought it might be trying version detection is via checking version of a Windows DLL, but I couldn’t identify this clearly from the ProcMon tracing. 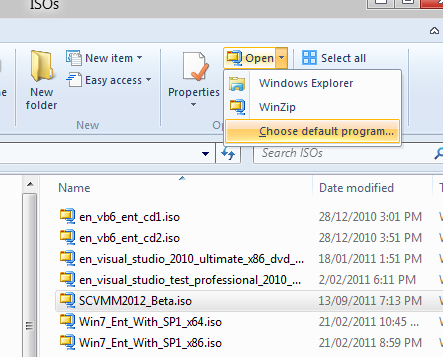 I now create & install Win7RTMVersionLie SHIMs. Yes, the C# .NET Managed Code is not affected. But don’t worry – .NET applications are a reverse engineers dream come true, being about a million times easier to patch a .NET binary than a Win32 binary. I did try to edit the IL code and re-compile it but didn’t have much success there, (maybe not enough sleep?) But I can see this function is in SetupFramework…I replaced the versions in the binary , the DLL still loaded fine, but still failed on version check. The PrerequisiteInputFile*.xml contained the OS version detection logic. Now I guessed just from the type of numbers that they represented language of install. So note to fix install for *every* language you would need to update each XML. As I was just using English I only fixed the file ending in 1033.xml. OK we made it past the pre-req check! 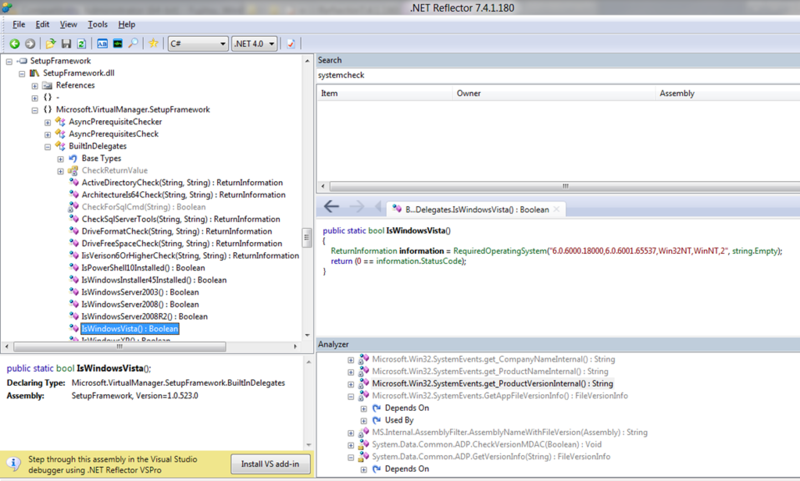 This entry was posted in .NET, Application Compatibility, Windows 8 and tagged SCVMM Windows 8 Install Reflector. Bookmark the permalink. nice work, man. thanks for posting this. thanks man ! after changing the compatibility of the main setup.exe, and just before installing the console changing the temp xml file everything was managed to install !! thank you. Hi, does the trick work on RTM? Thank you for your response. I actually meant to say if the trick works for *RTM version of SCVMM* (not the OS)? I changed the XMLs but the wizard keeps saying it won’t install because my OS is incompatible. 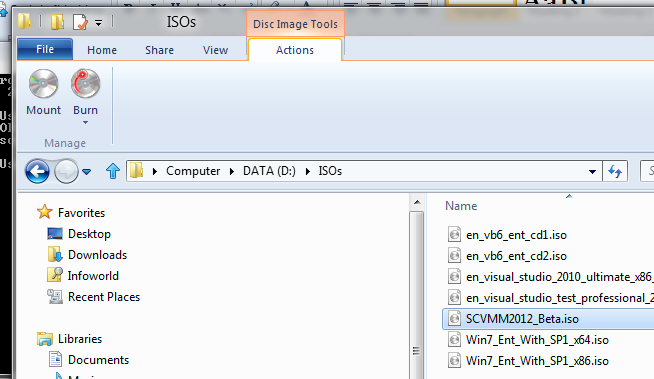 Possibly something has changed in how the RTM version of SCVMM checks for the target OS version. Is there not a simpler way to get round this? 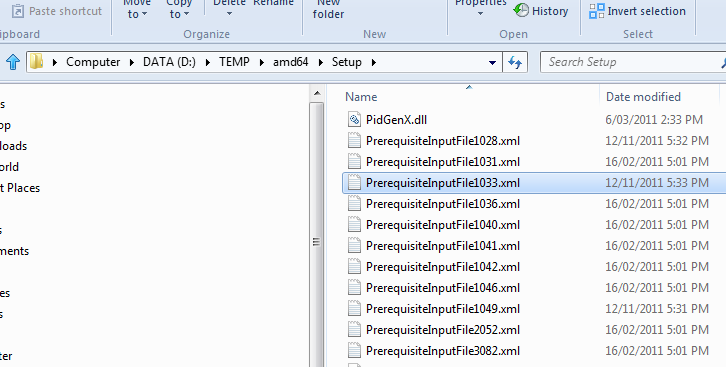 to install SCVMM2012 in Windows 8 RTM, you need to edit the “PrerequisiteInputFile1033” or whatever languaje you use, and replace in the whole file the “6.1.7600.0,6.1.9999.9999” to “6.2.9200.0,6.2.9999.9999” it seems that the build numer changed from this article to the final version. 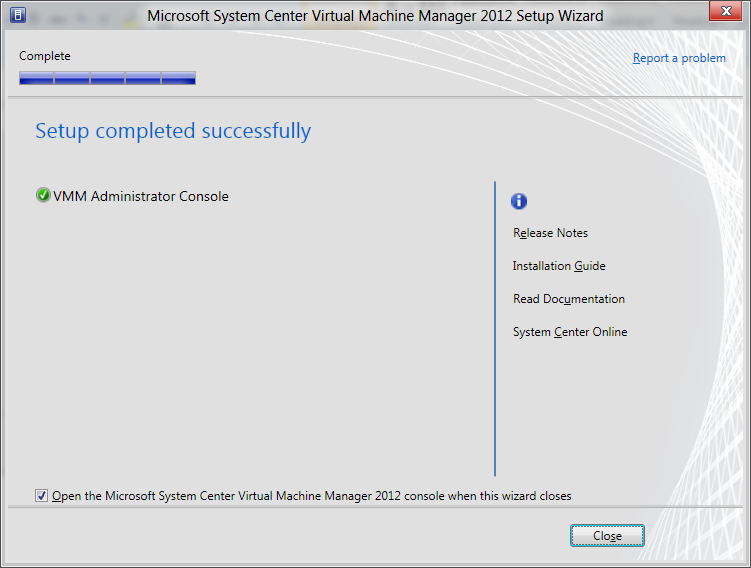 The article speaks of installing beta version of SCVMM 2012 on beta version of Windows 8. 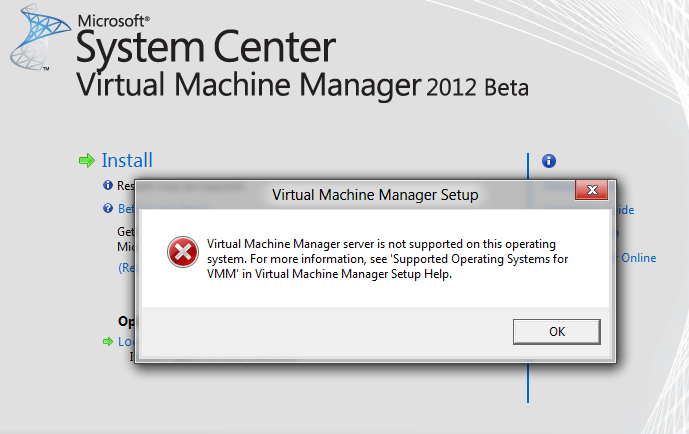 It’s understood that you can trick beta version of SCVMM 2012 to install it on RTM version of Windows 8. 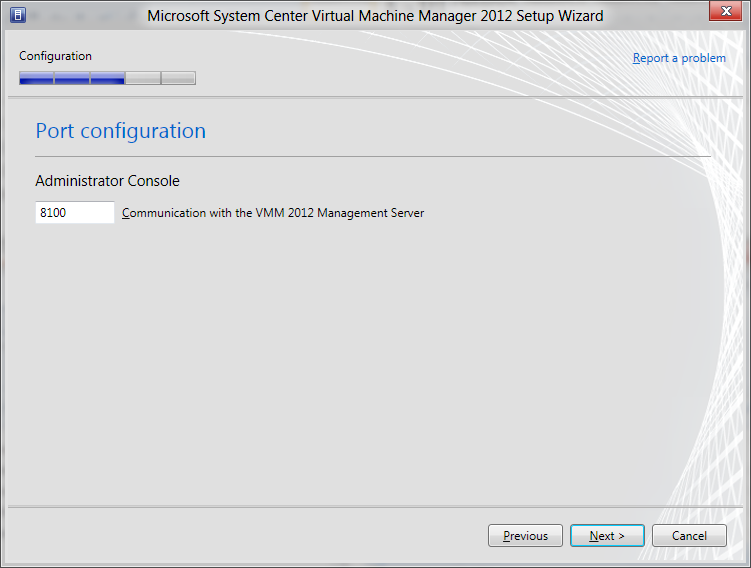 Can you however trick the RTM version of SCVMM? 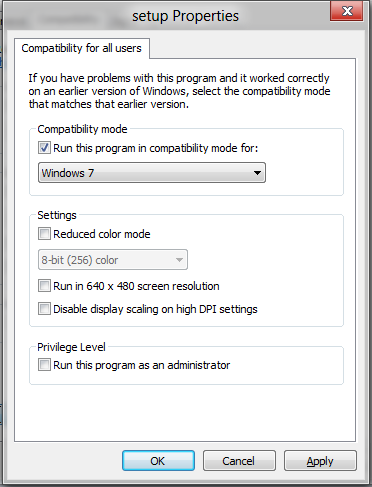 I’ve tried replacing build numbers of Windows 7 (6.1.7600.x,x.x) with the build number of Windows 8 (6.2.8400. * for Release Preview and 6.2.9200. * for RTM) but that did NOT work for RTM version of SCVMM 2012. 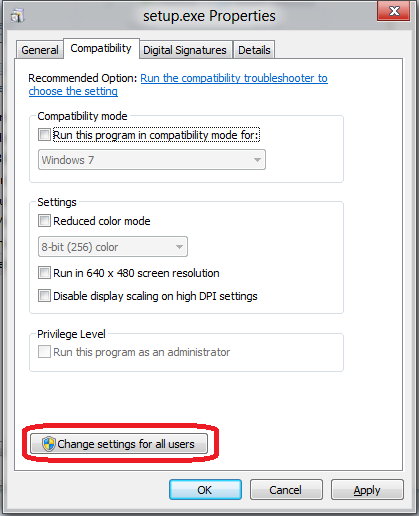 It still says that setup cannot continue because of incompatible OS. 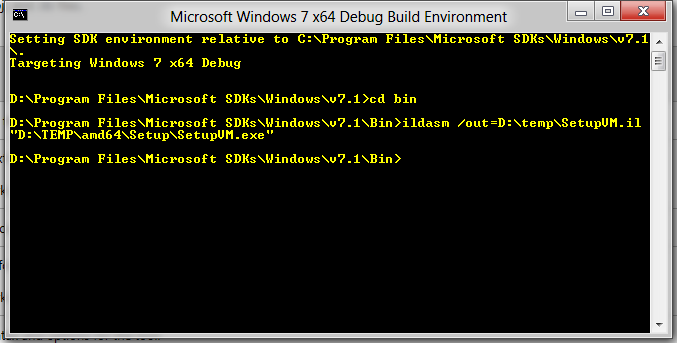 BTW, do I have to install WAIK for Windows 7 to install SCVMM 2012 on Windows 8? great Post Nicely DONE!! 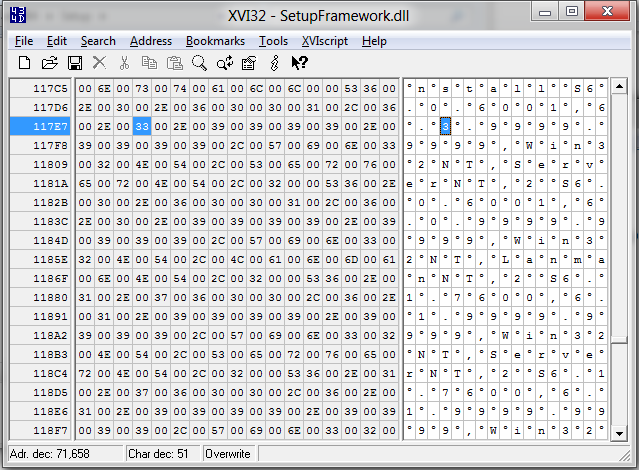 I simply modified the .xml files ending with 1033 to the updated version check and changed the setup.exe to win 7 mode and installed without a hitch! !